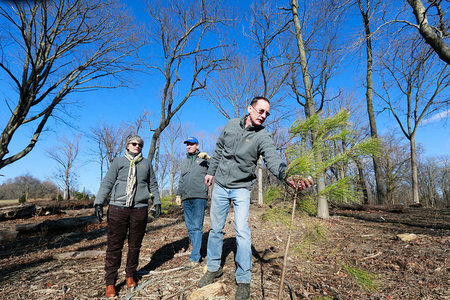 The Urban Forestry and Ecosystem Management Division of Philadelphia Parks & Recreation is responsible for managing and protecting Philadelphia's natural resources for the benefit of the citizens of the city and the region. Within the Urban Forestry and Ecosystem Management Division of PPR resides the expertise of 18 years of natural land management of nearly 6,000 acres of parkland and a century of responsibility for the hundreds of thousands of street trees in the City of Philadelphia. The Urban Forestry & Ecosystem Management Division released the Parkland Forest Management Framework in April 2013, an innovative action plan that guides restoration efforts in the city's natural areas. The ultimate goal of the framework and its recommendations is to achieve a viable, self-perpetuating, native-dominated and resilient forest ecosystem. As part of the Framework, PPR has launched three pilot restoration projects in Cobbs Creek Park, Wissahickon Valley Park, and Pennypack Creek Park. Information about those projects, background data and interactive data collection is available through this site.